It did not start well on Sunday, but as has always been the case the best is always yet to come in the biggest events, and while the finishes in recent Indianapolis 500-mile races have never necessarily been exactly the same, they have always been exciting. One exception to that golden rule though came in the 2000 race, when a 24 year-old Colombian named Juan Pablo Montoya literally outclassed the field, leading 167 of the 200 laps to win the race by more than seven seconds on Buddy Lazier. Fast forward 15 years and the winner is the same, however the win this time though took a lot more effort. 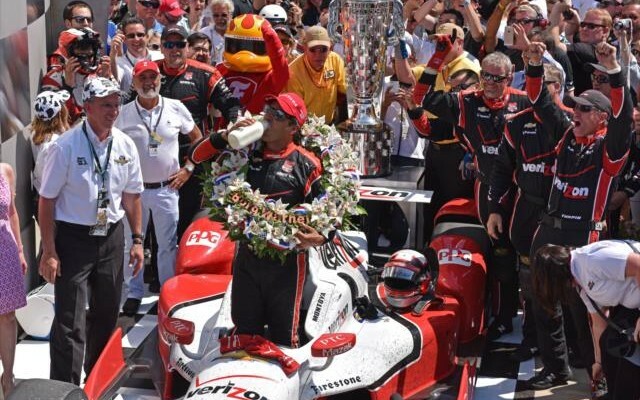 Sure, the veteran Team Penske pilot made it look simple enough, charging from third to first in just a lap and a half, to eventually beat teammate Will Power for his second Indy 500 win, but it was much more complicated than that. Early on Sunday, May 24th, 2015, the story line and the hopes for a victory looked very, very bleak. Not even before the first green flag lap was completed, Montoya had already suffered a broken right rear wheel guard after being hit from behind by Andretti Autosport’s Simona de Silvestro, an incident that forced his Team Penske pit crew to change the entire rear wing assembly prior to returning to action. Once racing got going in proper, Montoya moved quickly from 30th back into the top 15, when the first green flag pit stops began and suddenly; a second roadblock. Although he was running within the pit road speed limit of 60 miles per hour, he came into his pit box too hot and overshot the marks and ran over an air hose. Thankfully, the crew managed to push him back into position, and instead of being hit with a drive through penalty to boot, the Colombian was only given a warning for the incident. By the time of the second caution flag when Jonathan Byrd Racing’s Bryan Clauson tagged the fourth turn wall on lap 64, Montoya had worked his way back into the first ten and would stay in contention in an Indy 500 that was quickly becoming a match race between the sport’s two most successful outfits: Team Penske and Chip Ganassi Racing. 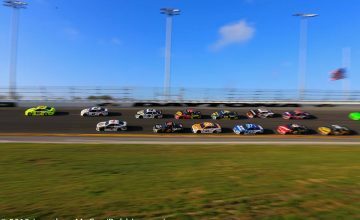 For the first 300 miles, it looked however that the most likely winner would be either Ganassi top challenger Scott Dixon or Team Penske’s newest member Simon Pagenaud, who traded the lead early, with Dixon perhaps featuring just a little bit more pace compared to the Frenchman. Montoya and teammate Will Power were within range, as was Ganassi x-factor Charlie Kimball. The story started to enter its final phase in the last fifty laps and the first casualty would be 2013 Indy champion Tony Kanaan, who tried a more aggressive tact in setup that last year bit his teammate Scott Dixon. This time Kanaan would fall victim as he found the wall in turn three. The second to fall by the wayside was Pagenaud, who in close quarters racing suffered a broken front wing and then plummeted through the field, creating a complete bottle neck in the process. The bottom in the ordeal fell out on lap 177 when Sebastian Saavedra and Jack Hawksworth tangled in turn three and collected rookie Stefano Coletti, bringing out the sixth and final caution of the day. The result was a 15-lap shootout to the checkered flag with Power leading the final foursome till Dixon moved to the top at lap 190. Power also lost out to Montoya for second, but would fire back quickly jumping back up to first in three laps, taking advantage of a change to a low down force setup during the final pit stop, 30 laps from the end. Montoya would drop back to third setting up the final scenario. First to go was Dixon on lap 196 and then the winning move on Power three laps from the end. The victory is the 14th in American open wheel competition for Montoya, who becomes the 19th driver in the history of the Indianpolis 500 to win the race more than once. The win also adds to Roger Penske’s amazing history at the Indy 500 as a car owner. He has now won the race 16 times, with 11 different drivers. The runner-up finish for Will Power, is his best result in eight tries at Indy, but still not what he was after claiming the season focus for 2015 was primarily about winning the Greatest Spectacle in Racing. 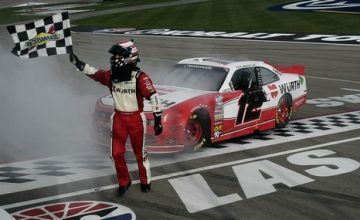 Power looked to be on his way to a sweep of both Indy races in the month of May, having claimed the Grand Prix of Indianapolis two weeks ago, but after giving way to Montoya the more aggressive setup caught him out. While Dixon could not hang on, his teammate Charlie Kimball took advantage to claim the final spot in the top three, his best performance to date on an oval in the IndyCar Series. Dixon held on to finish fourth, while Graham Rahal charged late to finish fifth for his third consecutive top five finish and the best effort for a Honda in the race. The Verizon IndyCar Series returns to a road racing format with the doubleheader Chevrolet Dual in Detroit at The Raceway at Belle Isle next Saturday and Sunday. Stay tuned to Rubbings Racing for further stories on the top finishers in the 2015 Indianapolis 500 coming up later this evening from both Matt Embury and Zach Catanzareti.